Books are a very big thing in this household. We have a decent amount of story time each night without fail. Lily has a huge collection of books on her bookshelf which she can access at any time and her book collection is always growing. Books have so many great uses, they are great for the imagination, great for learning, and used often to help children to settle to bed. But another good use for books are for when you need to introduce something new to your child, or maybe even helping them get over a fear or solve a problem. I recently bought Lily 3 books that I feel are going to be really helpful for Lily at the moment. 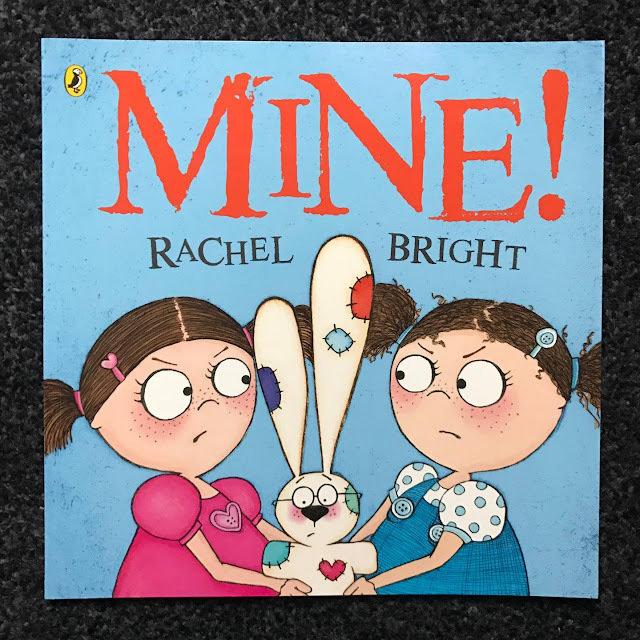 The first book is called Mine by Rachel Bright. 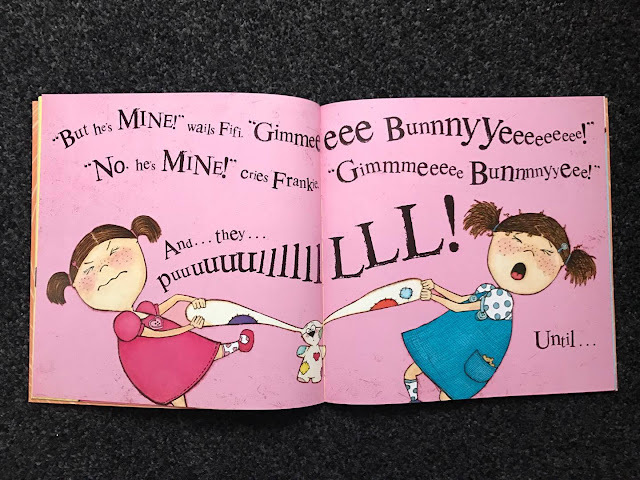 I bought this story for Lily because there was an incident recently at Nursery where Lily and another child had a disagreement over a toy and Lily ended up getting bitten on the cheek. I wasn't there to see but Im guessing the disagreement was about sharing. Lily can be great at home sharing as I always encourage her to do so. But since she has started nursery I have noticed that when we are out and about at places like play group, she is very over protective of the toys she is playing and gets very upset when children come near her if she has something that she really doesn't want to stop playing with. Toys which she is obviously thinking "mine" about. This story is a great and is all about having to share. It shows 2 twins who both love the same bunny and fight over it all the time. In the end the bunny breaks because they wouldn't share. So they decided to find the perfect way to be able to both get the bunny and take it in turns. Its a fun story with great illustrations and its very child like which i'm sure your child will find relatable. Lily obviously enjoyed this story because as soon as I had finished reading it she wanted it again. I really hope it helps Lily understand a little more about sharing. 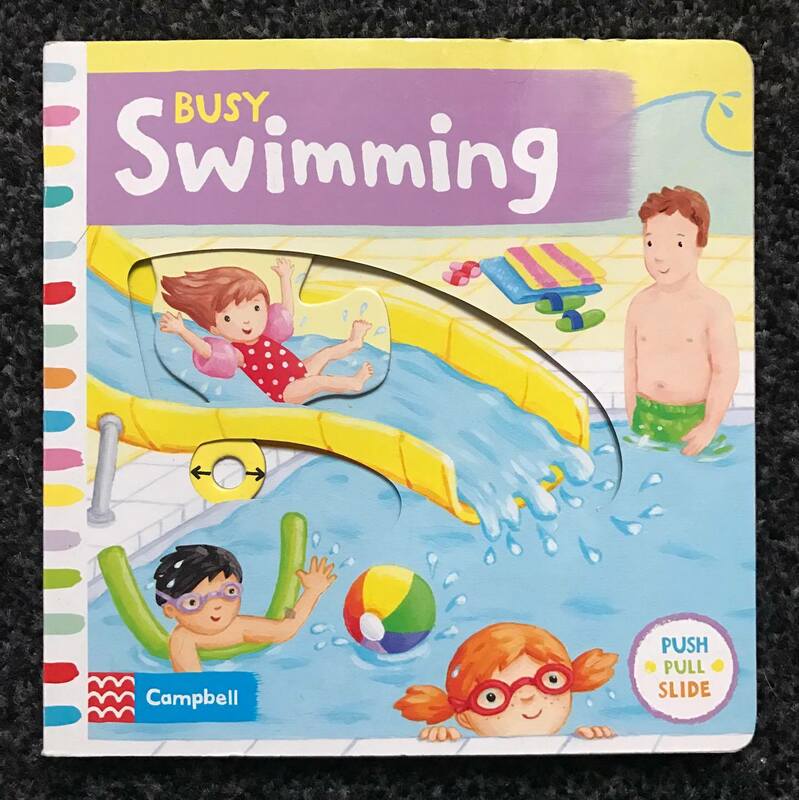 The next story is called Busy Swimming by Campbell Books. 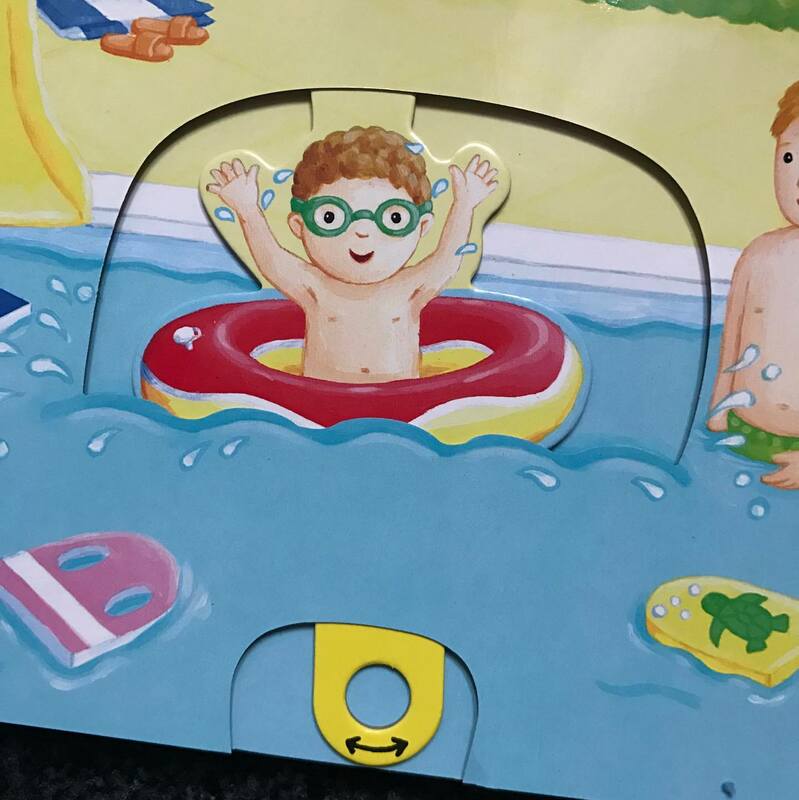 This book is perfect for introducing swimming to your child. I bought this book for Lily because although she has been swimming before, She hasn't been for a about a year as she started to have a dislike to water. She seems to be getting better now and so I am going to be taking her back to the pool next week. I thought that this book would be a fun book for her to see some images of a swimming pool and hear all about what happens there. The book doesn't have many words in and is more of a picture book, but the fun thing about this book is that it gets your child involve as there are sliders to make the characters move and also do things like change their swimming clothing. Lily has been enjoying pulling and pushing and sliding all the leavers and i'm hoping it is getting her excited about going swimming again. The last book is called Happy Street Doctor. I mostly bought this book because of Lily's current interest in Doctors. Its currently her favourite character to role play. The book arrived at a brilliant time as it just so happened that the day after it came, I ended up having to take Lily to the Doctors. It was great to be able to read this to her and point out all the different things that are at a doctors. The book doesn't have a huge story to it, but just enough to read and then let Lily take in all the items that are in the brilliant illustrated scenes. 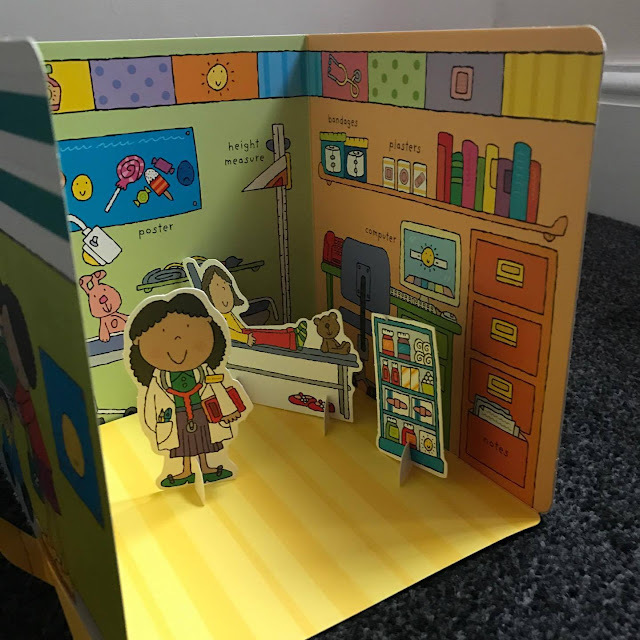 The book at the end opens out into a pop out surgery with cardboard play characters which you can then use to make your own hospital stories out of. 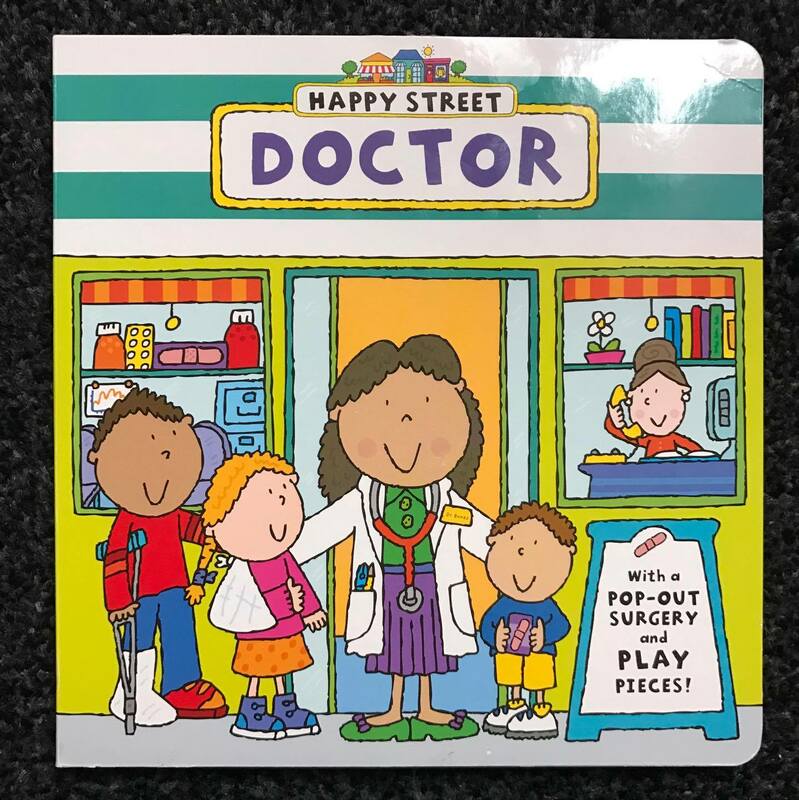 It is going to provided Lily with lots of Doctor role play fun. You can buy all of these books from a great website called Books and Pieces. Which of these books do you think you would find most helpful? Thanks so much Cassie for these great book reviews. It's really wonderful to see how you've used them to help Lily in her development. Mine! would be a fantastic book. I'm currently working with 2 year old children, and sharing is a really difficult concept for them. This would help them to see that sharing is not a terrible thing. What fantastic books, so bright and colourful too.